[Korea] Enjoy the Spring Season with Tulip Festivals! To welcome the warmer spring weather, tulip festivals are opening throughout Korea. 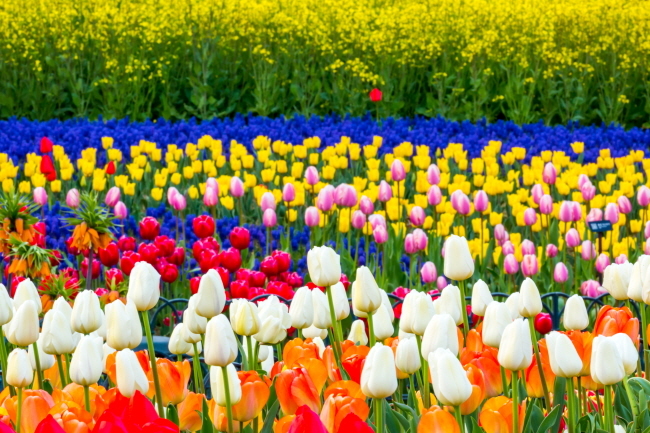 The representative tulip festivals are held at Everland and Taean’s Korea Flower Park. From March 16 to April 28, Everland Tulip Festival will feature 90 different types of flowers from daffodils to muscari. Visitors will be able to enjoy various entertainments from performances to art exhibitions and parades. At the Four Seasons Garden, a tulip garden similar to the drawing by Dutch painter Pieter Mondriaan can be seen. Visitors can see more of Mondriaan’s art work at the studio next to the Holland Village, where a three-dimensional mirror tunnel and touch light artwork can be experienced. Starting March 29, a spring-themed character performance and photo time will be held four to five times a day. Carnival Fantasy Parade and Moonlight Parade will also present a special spring-time only performance. At Korea Flower Park, Taean Tulip Festival, chosen as one of the top five tulip festivals in the world in 2018, will be held from April 13 to May 12. Not only will the festival feature over 200 types of tulips from kikomachi to world favorite to purple flag, various events and activities are also planned. Visitors can enjoy activities such as feeding animals and face painting, as well as watch guest singers perform and experience the LED Light Festival. LED Light Festival will continue even after the tulip festival ends, but the night admission may be cancelled in the case of rain. Detailed information about the Taean Tulip Festival will be posted on the official website at a later time. Visitors to Taean can also visit Kkotji Beach near the festival ground, where famous Halmibawi and Harabibawi Rocks (Grandmother & Grandfather Rocks) are located. Enjoy the Spring Season with Tulip Festivals!